Here’s something to chew over: Australian artist Courtney Coombs is coming to Tokyo in November to host a short series of events based on LEVEL art collective’s ongoing project, “Food For Thought”. The events, which have been previously held in the Australian cities of Brisbane and Melbourne, combine social activism with art. The concept is inspired by Judy Chicago’s iconic artwork, ‘The Dinner Party’ (1974-79), a sculpture that symbolically set a place at the table for women and sparked debate among the art world. 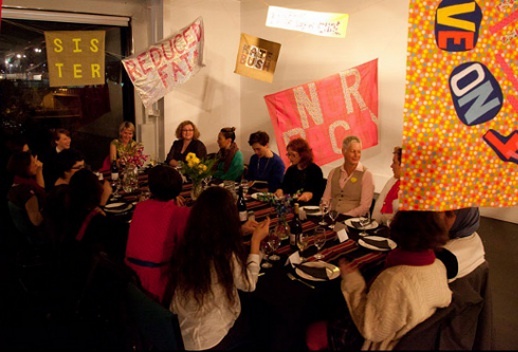 Tokyo women (yes, only women) are invited to participate by sharing a meal and talking about feminism and art. With the help of an interpreter, discussions will be held in both Japanese and English. The free events are held in groups of 12, with no spectators, to encourage casual, free expression among participants.